Last week, Amazon announced that it would launch its own grocery chain. This is Amazon’s second big leap into groceries. In 2017, the company bought grocery chain Whole Foods for $13.7 billion. All of this prompted a number of speculations about Amazon’s move into “offline” retail. While Whole Foods gave Amazon access to 479 physical stores, the company, in effect, has little interest in the brick-and-mortar presence. Here’s the thing: Amazon doesn’t want to sell you groceries at physical stores. It is quietly preparing for battle that will decide who leads the future of groceries. It’s a hundred-billion-dollar industry that is growing exponentially. Yet it’s still off the radar for most investors. I’m talking about grocery e-commerce. Customers order their groceries online. They then pick up their groceries… or in some cases, have them delivered to their door. 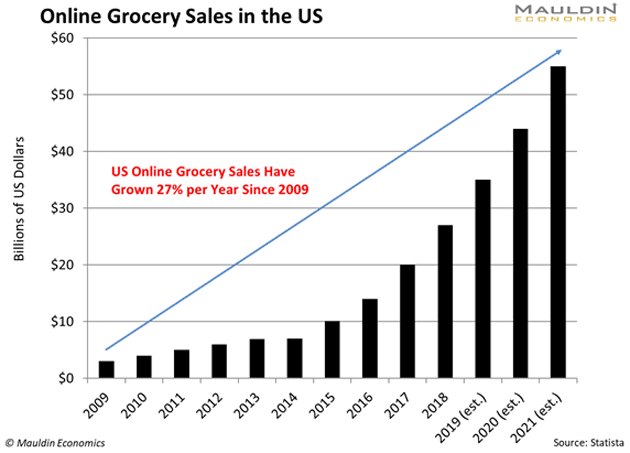 The online grocery market is still in its infancy. And that’s good news for investors because it’s set to explode. The market is now worth $27 billion, but it’s expected to quadruple by 2023 according to market research firm Packaged Facts. That means investors buying into this industry early on have the potential to earn massive profits. And there will be tons of profit. Sales in the online grocery market have tripled in the last five years. Like any high-growth industry, it has attracted many players. Amazon is one of the biggest. But here, it’s lagging behind the original retail giant: Walmart. Walmart was late to e-commerce, but it is rapidly making up ground. In fact, Walmart recently passed Apple to become the third-largest e-commerce platform in the US. Walmart has done so by buying established players in the e-commerce space. The company bought e-commerce website Jet.com for $3.3 billion. Since the purchase in 2016, Walmart has grown its e-commerce sales from $13.4 billion to $23.8 billion. That’s a 78% increase in just two years! And it shows no sign of slowing down. 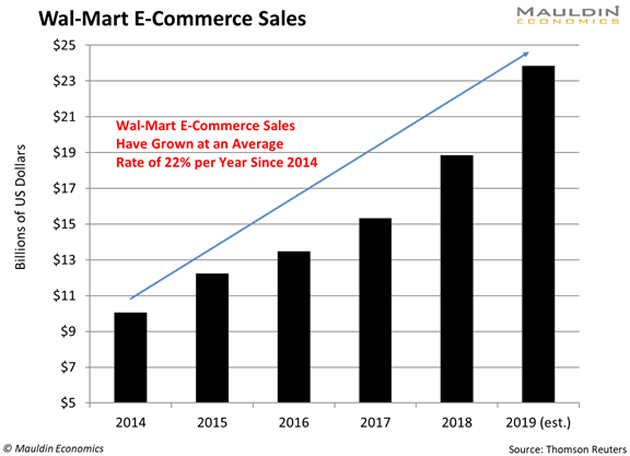 Last quarter, Walmart’s e-commerce sales grew 43%! While the Jet.com acquisition helped cement Walmart’s online presence, the company’s bread and butter is groceries. In fact, grocery sales made up 56% of the company’s 2018 sales. Now, Walmart is bringing this grocery expertise to its fast-growing online presence to become the leader in grocery e-commerce. I have no doubt Walmart will be the biggest winner in this market. It all comes down to Walmart’s physical footprint. Amazon has only 479 Whole Foods locations so far. That’s well below Walmart’s 4,200 locations. Now, it is taking this to a whole new level by introducing grocery delivery. By the end of 2019, Walmart expects to cover 40% of the US population with delivery through 800 of its stores. Unless Amazon buys another giant brick-and-mortar retailer, it will never be able to match Walmart’s store footprint. Analysts at Deutsche Bank expect Walmart to control 17% of the online grocery market by 2025. That’s up from 12% today. That would add roughly $25 billion per year to Walmart’s sales. That adds about 8% of sales to Walmart sales every year. While it may seem small, that can really move the needle for a slow-growth company like Walmart. But there’s another major reason investors should consider buying Walmart. Walmart pays a safe and stable dividend. My readers know my goal: finding safe and profitable dividend-paying stocks. And Walmart fits the bill. It’s not going to explode like Amazon has over the last five years. But it’s a stable and safe dividend-paying stock that’s suitable for any investor. I use a system called the Dividend Sustainability Index (DSI) to assess the safety of a dividend. You can read about the DSI in detail here, but here’s how it works in a nutshell. The system looks at three key metrics: payout ratio, debt-to-equity ratio, and free cash flow. 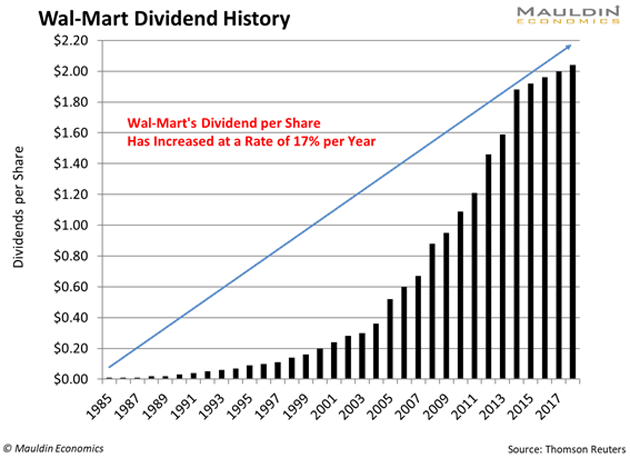 Walmart and its 2.2% dividend pass this test with flying colors. The company has a low payout ratio of 64%. Anything below 80% is solid. That means there’s little chance Walmart will cut its dividend. Walmart also has a low debt-to-equity ratio of 36%. Add in the fact that the company has grown its free cash flow by 12.7% per year since 2014, and you have a near perfect DSI score. I recommend safe and stable dividend-paying stocks like Walmart every month in my premium investing service Yield Shark. What have you got to lose? 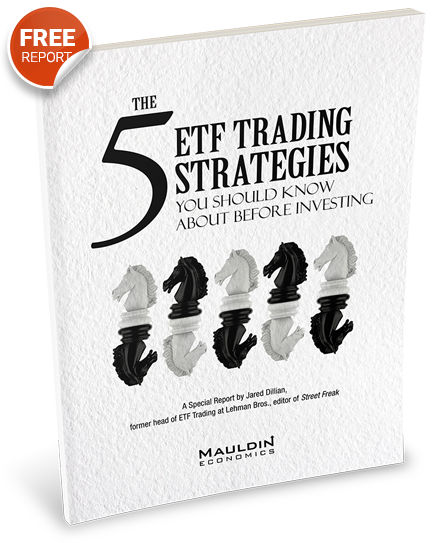 Check out my free special report here.